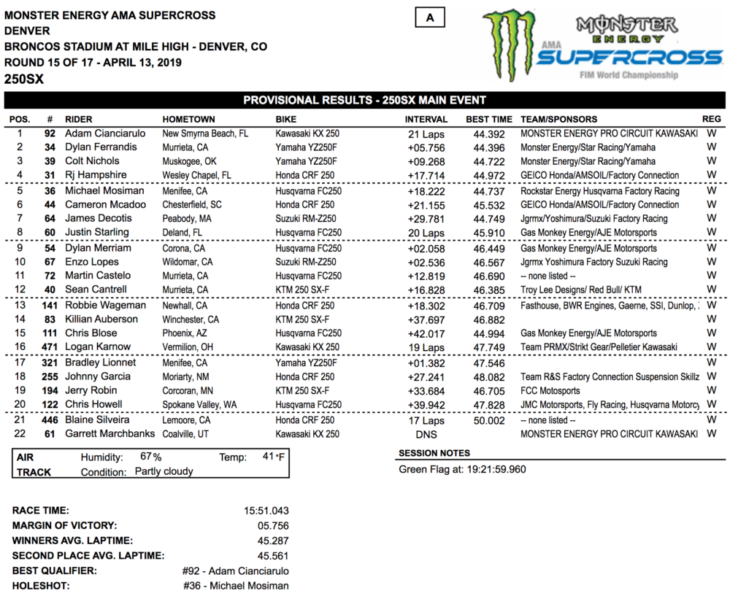 The 2019 Monster Energy Supercross Series is coming down to the wire, and with three rounds left to go, the series hit Denver’s Broncos Stadium at Mile High to test the top supercross racers in the world in the thin, cold air of early-spring in the Rocky Mountains. Red Bull KTM’s Cooper Webb led the title chase by 21 points over Monster Energy Kawasaki’s Eli Tomac and Webb’s teammate Marvin Musquin, who were tied for second in the championship, and Webb and Tomac got into it early with some aggressive racing in their 450cc heat race before lining up for the 450cc main event. Eli Tomac celebrates the win alongside Cooper Webb and Marvin Musquin. In the main event, Musquin got the holeshot he needed, but Tomac was absolutely on fire, going from just outside the top five to second place within just a couple laps, and then catching and passing Musquin for the lead before pulling away to what seemed to be a routine, easy victory. Behind him, Webb was going to work, but not nearly as quickly or decisively as Tomac did before him. Webb was behind Tomac on the start and it took him a handful of laps to get by Rocky Mountain ATV/MC KTM’s Justin Bogle for fourth, and then even longer to get by Tomac’s teammate Joey Savatgy for third. But once by Savatgy, Webb quickly ate up the gap to his teammate Musquin and made the pass stick through the whoops to secure second place with a handful of laps to go. 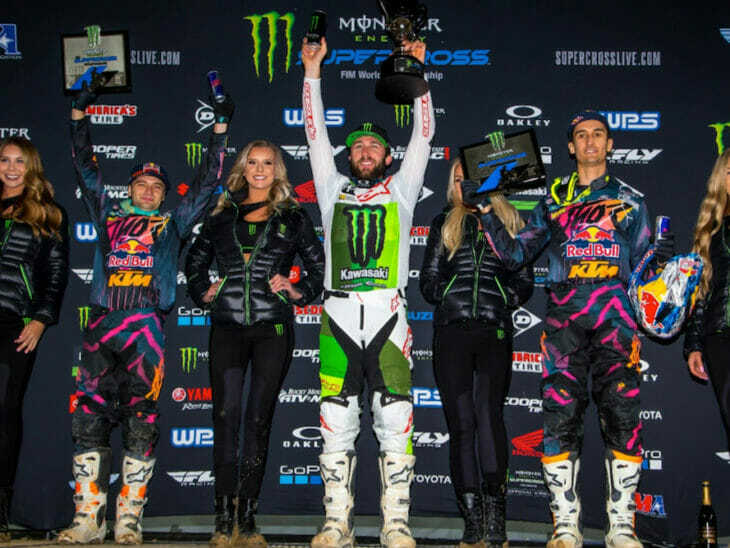 The pass had significant championship implications, as Webb put Musquin 23 points down in the title chase with two races to go, and managed to lose only three points to Tomac, who dominated the event in Denver. The series now takes its first weekend off since it started in early January this coming Easter weekend, then picks up for the final two rounds in East Rutherford, New Jersey, and Las Vegas, Nevada. 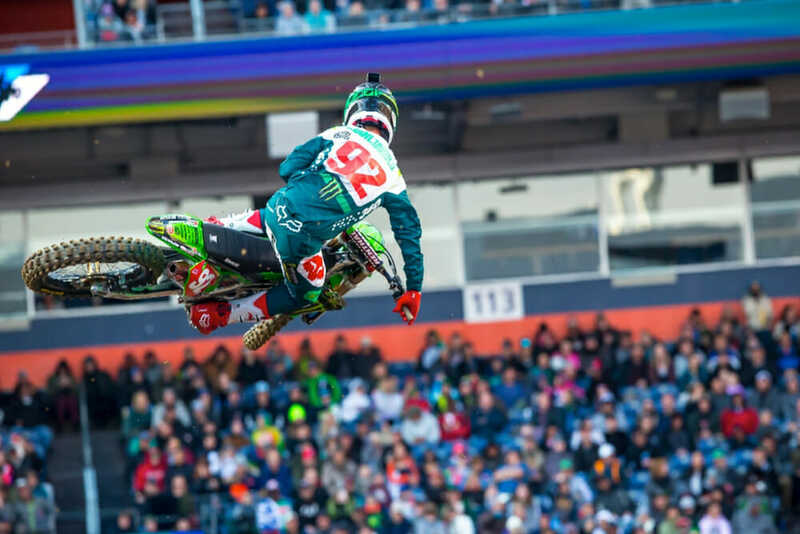 Mathematically, Webb can afford to lose 17 points to Tomac in the final two races, if that’s what the circumstances merit, which equates to a fourth place and a fifth place in the final two races if Tomac manages to win them both. And in the 250cc class, Monster Energy/Pro Circuit Kawasaki’s Adam Cianciarulo came into Denver—the penultimate round of the 250cc Western Regional Supercross Series—with a five-point lead over Monster Energy/Yamalube/Star Racing Yamaha’s Dylan Ferrandis. Ferrandis came into Denver controlling his own destiny: If he won the final two rounds, he would win the championship. However, the story of Ferrandis’s season is that his starts need to be a lot better, and that story carried through Denver, as Ferrandis started at the tail end of the top five and could only manage to catch up to second at the finish, behind Cianciarulo, who dominated the main event. Ferrandis’s teammate Colt Nichols finished third just in front of GEICO Honda’s RJ Hampshire and Rockstar Energy Husqvarna’s early race leader Michael Mosiman in fifth. 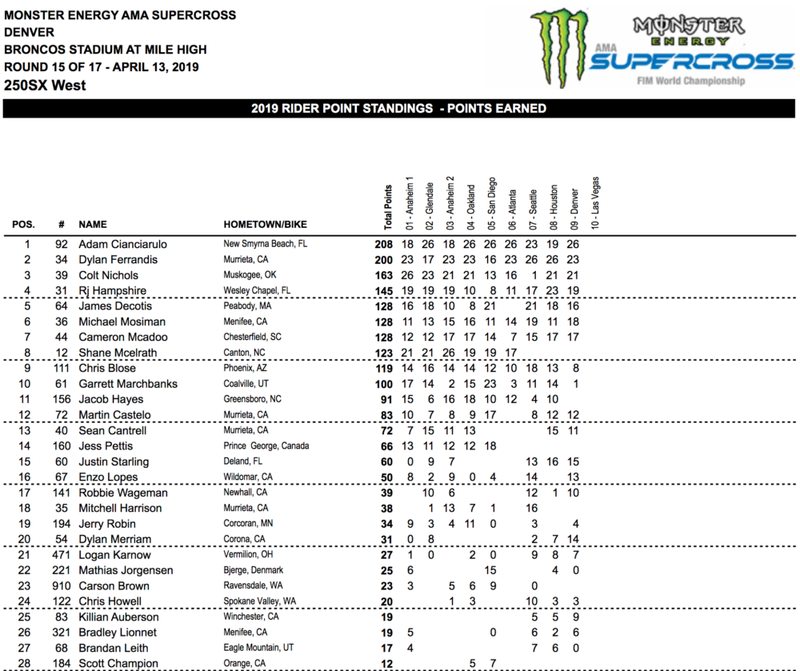 Cianciarulo now carries an 8-point lead over Ferrandis into the series finale, the 250cc East/West Shootout in Las Vegas three weeks from now. 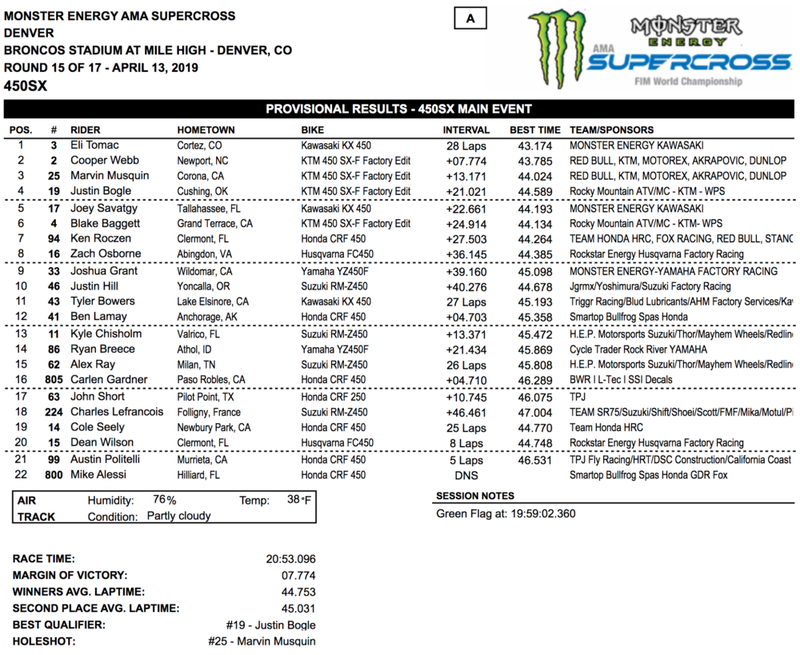 Qualifying is complete at the 15th round of the 2019 Monster Energy Supercross Series in Denver, Colorado, April 13. It’s cold in Denver and the first practices sessions were held as light snow came down. 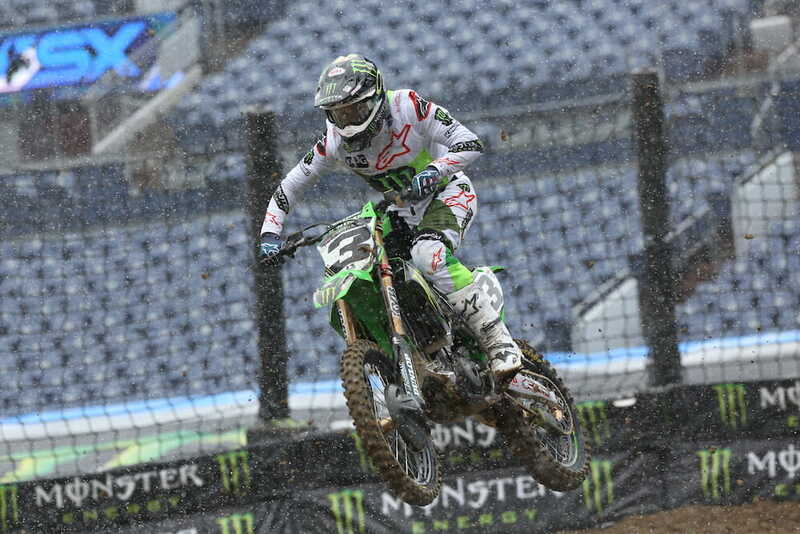 Weather conditions have since improved since then and so has Eli Tomac’s qualifying times. Eli Tomac is the 450SX-class top qualifier. Dean Wilson (Rockstar Energy Husqvarna) was quickest in the first timed practice, but Tomac (Monster Energy Kawasaki) found his groove and cracked the 42-second barrier. He is the only rider to do that with a 42.905. His nearest rival is Marvin Musquin (Red Bull KTM) with a 43.207, and right behind him are six other riders in the 43s: Joey Savatgy, Wilson, Cooper Webb, Zach Osborne, Cole Seely and Ken Roczen, in that order. Tomac could be the rider to beat tonight not just because he is the top qualifier but he also has the backing of the home crowd. He seems extra motivated tonight, which he hopes helps him chip away at Webb’s 21-point lead in the series. Tomac and Musquin are both tied in second. Marvin Musquin (25) and Tomac are the top two qualifiers in the 450SX class, and they are also the two riders chasing points leader Cooper Webb in second place in the championship. However, despite being just slightly off the pace, many are predicting a Roczen win tonight. 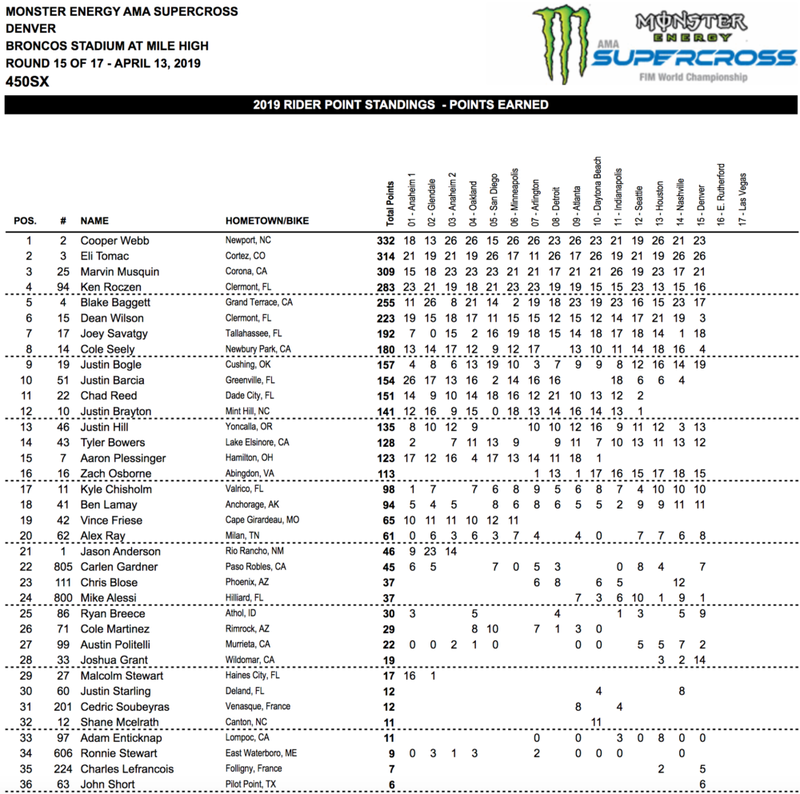 There are just two 250SX West riders in the 43-second bracket–points leader Adam Cianciarulo (Monster Energy/Pro Circuit/Kawasaki) with a 43.746, and Colt Nichols (Monster Energy/Star/Yamaha Racing) with a 43.778. Nichols’ teammate, Dylan Ferrandis, the closest rider to Cianciarulo in the championship, is right there in third with a 44.206. James Decotis (44.368) and Michael Moisman (44.409) round out the top five 250SX West qualifiers.